August 29, 2018 By Lisa Sharp Leave a Comment As an Amazon Associate I earn from qualifying purchases. This post may contain other affiliate links I earn from as well.Click here for full disclosure. When you get a new iPhone do you just stick your old one in a drawer? 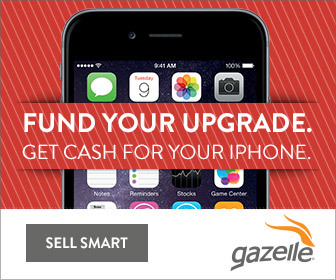 You can sell your iPhones with Gazelle. Thanks to Gazelle, I was compensated for this post. This post also contains affiliate links and I will be compensated if you make a purchase after clicking on my links. It’s a big deal when Apple announces new iPhones. There are always new features, sometimes new styles, and everyone wants one. It’s rare that we keep our phones until they break, instead, we often upgrade at least every couple of years. Technology changes so fast we feel like we need to. And we always need more battery life because we all live on our phones. So when you get your new iPhone what do you do with your old one? Do you have a pile of them in a drawer somewhere? Do you throw them away? Throwing electronics like iPhones away causes big problems. More than 50 million tonnes of e-waste will be generated this year alone and phones are becoming a big percentage of e-waste. Not all e-waste recycling is done in a responsible way. Instead, it’s often >sent to China, Africa, or India where there are few environmental laws. Instead of throwing your phone away or sticking it in a drawer somewhere you can sell it with Gazelle and get some money back. Gazelle is helping keep iPhones and other electronics from becoming e-waste. Their main focus is to reuse the products but will responsibly recycle phones that hold no value. It’s a great way to help the environment and get a little cash at the same time. You can also buy used iPhones from Gazelle if you want to upgrade but can’t afford the newest, or just want to be a bit greener. And the best part is it’s really easy to sell your iPhone with Gazelle. Find your item on Gazelle. Let Gazelle know what condition your phone is in by answering a few questions. If you are happy with the offer you simply complete your checkout and let them know how you’d like to be paid. You can be paid via check, PayPal or Amazon.com gift card. Shipping is free and for qualified orders (small electronics over $30.00) they will send you a box. Once your box is received and the item is checked you will get paid. It’s a quick and easy process and you can feel good about keeping your iPhone out of the landfill! Want more green living tips? Sign up for our newsletter.